The S&P/TSX Composite climbed another 1.0 per cent for the week ending with Thursday’s close and remains in frothy, overbought territory according to Relative Strength Index (RSI). The benchmark’s RSI of 74 is well above the sell signal of 70. There are only two index members trading at technically attractive, oversold RSI levels below the buy signal of 30. Crescent Point Energy Corp. is the most oversold stock in the index, followed by SNC-Lavalin Group Inc. I chose SNC-Lavalin for the focus chart this week. Under normal circumstances I wouldn’t pick a company with this much headline risk, but SNC has endured poor news flow in the recent past and the chart might provide some guidance. 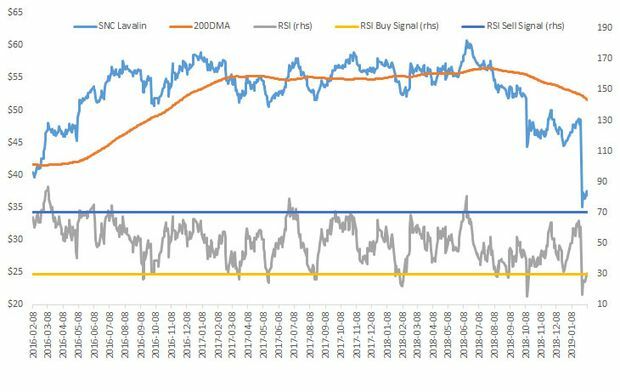 The stock price has been generally sensitive to RSI buy signals and the 200-day moving average trend line in the past 36 months. A buy signal in September 2016 turned out to be a profitable entry point as the price rose 12 per cent before mid-January 2017. A buy signal in February 2017 was followed by a smaller rally, and another in May of the same year forecast another 12-per-cent jump to July 14. Buy signals started working less well after the price moved below the 200 day moving average in August of 2018. August and September buy signals in 2018 did mark stabilization in the price after a downdraft but no rally occurred. The same thing happened in October – selling pressure eased after a buy signal but no rally. The 200-day moving average trend line also appears to have played a role in trading activity. The orange line on the chart acted as resistance to further gains in the February to May time frame. From February to June 2018, the trend line seems to have supported the price and prevented deeper corrections. The 200 day also provided support in July 2018. The most recent slide for SNC stock was severe and the price is now well below the 200-day moving average. Based on recent history, the most likely scenario is for the price to stabilize in the current range, but there’s little to suggest and upurge at this point. As always, this column is discussing technical views only and fundamental analysis should be completed before any transactions.